Typically we dip our artichokes in Miracle Whip (my husband) or Mayonnaise (me). The Roasted Garlic-Wine Dip is our new favorite. It makes a fabulous bread dip, too. While gariic is roasting, cut off stems of artichokes, and remove bottom leaves. Trim about 1/2 inch from tops of artichokes. Place artichokes, stem ends down, in a large Dutch oven filled two-thirds with water; bring to a boil. 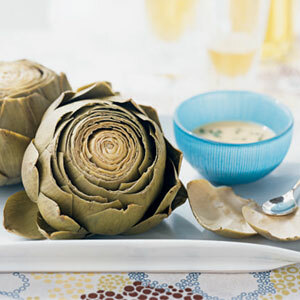 Cover, reduce heat, and simmer 45 minutes or until a leaf near the center of each artichoke pulls out easily. Remove artichokes from pan.